All our Hamburgers (Approx. 8 oz.) are mode with pure Ground Chuck. Served on a Sesame Seed Bun with a Cup of our own Cole Slaw, Tomatoes, Lettuce and Kosher Style Pickle. Your Choice of French Fries, Fruit, Cottage Cheese or Onion Rings. 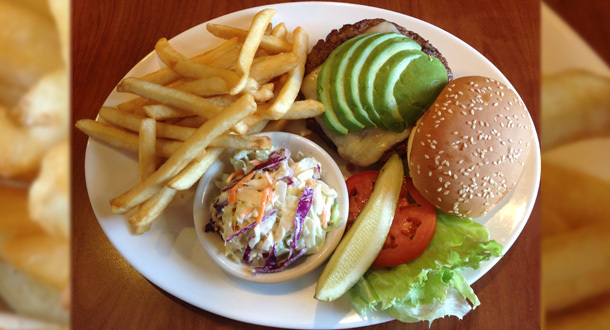 Avocado BurgerTopped with Jack Cheese and Fresh sliced Avocado. The Mushroom BurgerServed with grilled Mushrooms and Swiss Cheese. The Londoner BurgerServed with two crispy Bacon Strips and Jack Cheese. Patty MeltGround Beef Patty topped with melted Cheese, grilled Onions 0n Rye Bread and Served with French Fries. San Franciscan SandwichApprox, I2 oz. Ground Chuck on Sourdough Bread. Topped with Ham and Cheese Sauce served with French Fries. Harry’s Royal Burger12 oz. Ground Chuck Patty, with lettuce and Tomato Slice. The CalifornianWith Fresh Guacamole and Cheddar Cheese. The Greek Tycoon (Signature Item)Approx I2 oz. of Ground Chuck patty topped with Feta Cheese. Grilled Tomatoes and Onion on Sourdough Bread with French Fries. Spaghetti BurgerOur regular burger with a side order of Spaghetti with Meat Sauce. No French Fries. Athenian BurgerTopped with feta Cheese. The French BurgerWith crumbled Blue Cheese and grilled Onions. Chili BurgerWith our own Chili and your Choice 0f Cheese. Garden BurgerOur very tasty Vegetarian Burger.